In the next week (I hope), I’ll be reviewing Anna Krien’s Into the forest, her investigation into the longstanding conflict over logging native forests in our southernmost state, Tasmania. 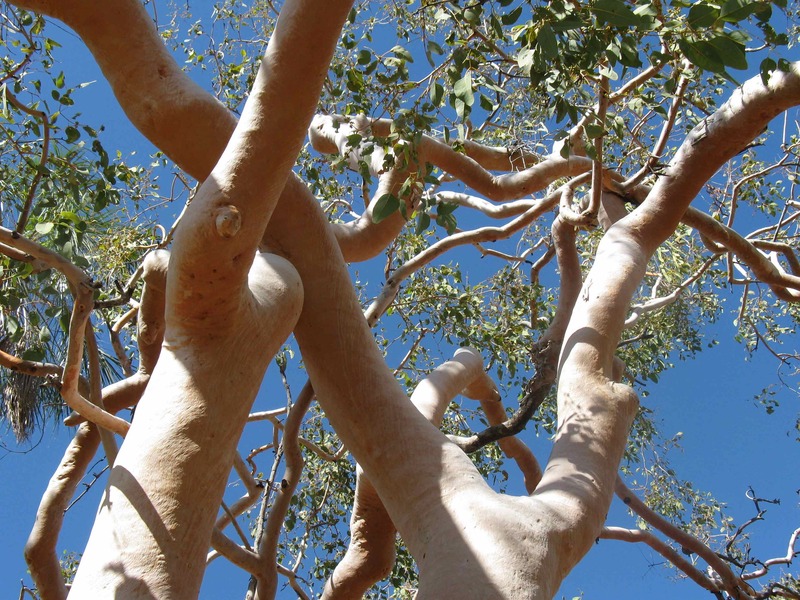 In the meantime, though, as I’ve been reading the book, I’ve been thinking again of the role eucalypts play in Australian life and culture – and, voilà, this week’s Monday musings was born. But, where to start? Why not with Waltzing Australia, an American blogger who has travelled extensively in Australia, written a book as a result, and is now writing a blog about her experiences? She complained – nicely of course – in our little comment to-and-fro on her visit to my city that “My whole first day there, I didn’t see any gum trees, and that made it almost seem that I’d somehow left Australia”. If that doesn’t tell you something about gums and Australia nothing will! There was a tree falling, one of the great, gaunt naked things that had been ringbarked long ago. All day it had swayed to and fro, rotten through and through; now there came up across the plain a puff of wind, and down it went before it. …They lifted it off the little bodies, the long silvered trunk with the gum dead and dried in streaks upon it… (from Seven little Australians, by Ethel Turner). Never fails to move me. As for which of the seven is so tragically killed, my lips are sealed, but let’s just say that, in contrast to Alcott’s book, it is not the meek, mild one. It is these circumstances which have been responsible for all those extremely dry (dun-coloured – can we say that?) hardluck stories which have been told around fires and on the page. All that was once upon a time, interesting for a while, but largely irrelevant here. If you haven’t gathered a sense of Bail’s tone and intent from this, you might when I tell you that the last species mentioned in the book is Eucalyptus Confluens! It is fairy story, a love story, and a meditation on stories, framed by gums in all their diversity: “A forest is language; accumulated years”. In Peter Temple‘s Truth, which I reviewed here a month or so ago, a running motif is the eucalypt and oak forest planted by Villani and his father. The trees provide an important point of contact for father and son throughout their lives, and the forest’s survival in the fire at the end signifies the survival too of Villani’s relationship with his father. Often of course, gums are simply the backdrop – the ever-present part of the landscape that makes that landscape recognisably Australian. They are an important part of the landscape in Chambers’ The vintage and the gleaning … just by being there. Before long, the strange, unorthodox beauty of the Australian gum tree, and many other manifestations of beauty peculiar to this country, will find a sure place in the standards of general culture, which will be one stage nearer universality and so much the richer. All this makes me wonder whether there is anything similar – any motif that has as much universal recognition – in other national literatures? Anyone? I don’t know that there would be a parallel in any other region, and certainly not in a region of comparable size. Maybe a specific tree in a limited area — a single forest or region — the redwoods of northern California, the chestnuts in certain regions of Europe, palm trees everywhere tropical, perhaps, if we stretch this to plants and not just trees, the saguaro cactus of northern Arizona. But there’s really nowhere else that has a “signature tree.” And the eucalypt truly is the signature tree of Australia: 3 out of every 4 trees in Australia is a euclypt, and of the several hundred species, only a couple exist naturally outside of Australia, and even those are found on near neighbors. (All the eucalypts one finds outside the immediate vicinity of Oz are exports.) Looking out my window now, in northern Illinois, I can see pines, maple, oak, elm, and poplar, for indigenous trees, plus a few introduced Russian olives. So the ubiquity of eucalyps is just one more thing that makes Australia special and remarkable. Thanks Waltzing … and thanks for engaging with the question. I like your example of motifs for regions within a larger place, like the saguaro, as you say, in Arizona. I wonder whether in other cultures/literatures there is some other motif besides a tree or plant? Come the think of it, does the Maple play a similar role in Canadian literature? Hmm…not, I think, as I’ve seen. On the flag but perhaps not quite the same motif? I think the sea or a river play into a lot of iconography, as do mountains, or the great steppes of Central Asia. Trees that do have some connection with local lore would be trees that produce food — the orange in Florida, peach in Georgia, or pecan in Texas. Nutmeg is so important to Granada that it’s on the nation’s flag. Much of Asia is identified by rice paddies. However, I don’t know that the sight of rice paddies is part of their iconography or of ours. And the maple leaf is bigger in eastern Canada, where you have all the maple syrup being made. It is where Canada started, so that gave them their icon. But Quebec has the fleur-de-lis, the middle provinces probably think either rodeo or mountains, and the west coast, salmon. Hopefully not! And, yes, I remember reading all of the books too. None had quite the same cathartic effect as the first though did they? I’ve mentioned befoer that I read Bail’s book and I quite liked it. Since I grew up in California where eucalyptus trees seem to be everywhere I assumed I knew all about them. I had no idea until I read Bail’s book that there were so many different kinds! It was quite the eye opener. LOL Stefanie … and you look at the Wikipedia list and there are even more. I can’t recollect whether I said this last time we mentioned it but we were surprised seeing eucalypts in California gardens in a highly pruned state. Poor trees, they did not look themselves!